With multiple premier Rivals of Ixalan limited events happening soon, I have spent the last few weeks sharing my thoughts on the format. Last week, I went over our team's draft notes from the Pro Tour, which included our testing results, pick order list and my strategies for the format. The link to the article can be found here. Today, I will be going over eight decks from my draft log – which is where I keep all the decks I have drafted in a format, with notes on each deck based on what I learned from that specific draft. Then, next week, I'll share an additional six more drafts from Grand Prix London, Pro Tour playtesting, and the actual Pro Tour. If you're keen to learn more about the fantastic Rivals of Ixalan Booster Draft format, I invite you to embark upon this journey with me. 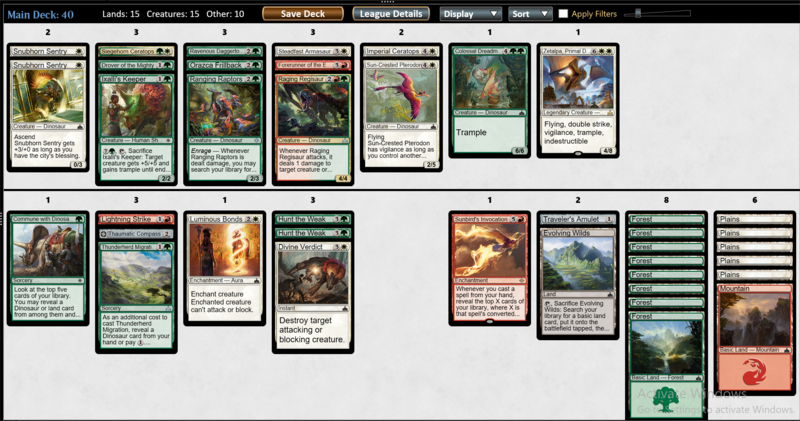 This was my first draft of the format, and after the drafting process, I thought my deck was pretty good. However, after playing the deck, I realized that I had slightly too many fillers. 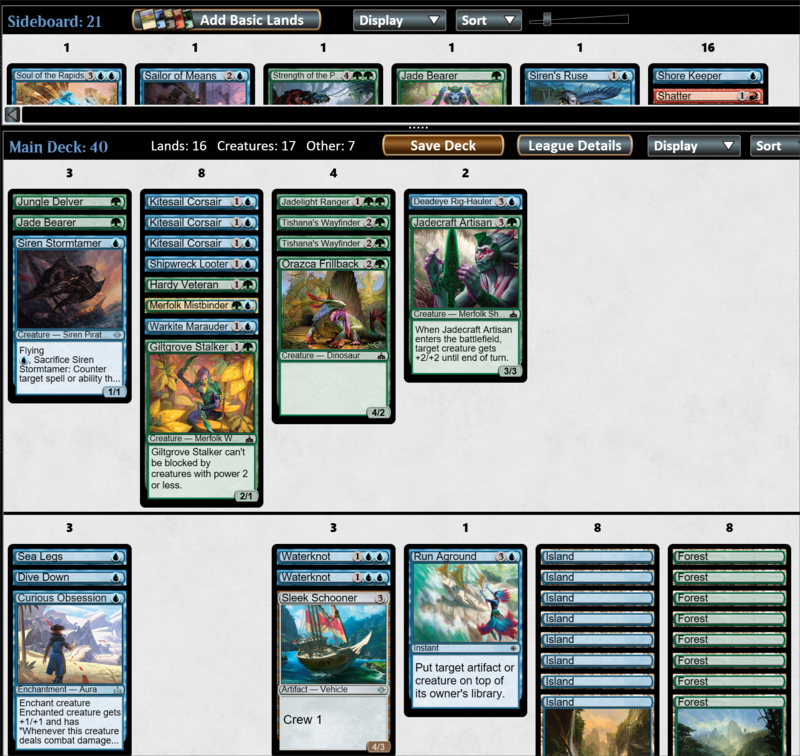 Sea Legs and Orazca Frillback were both underwhelming, and Jade Bearer felt disappointing even though it was a Merfolk. On the other hand, I was impressed by Giltgrove Stalker and how much damage it could get through for, and Curious Obsession ran away with the game when I enchanted it to a Kitesail Corsair. 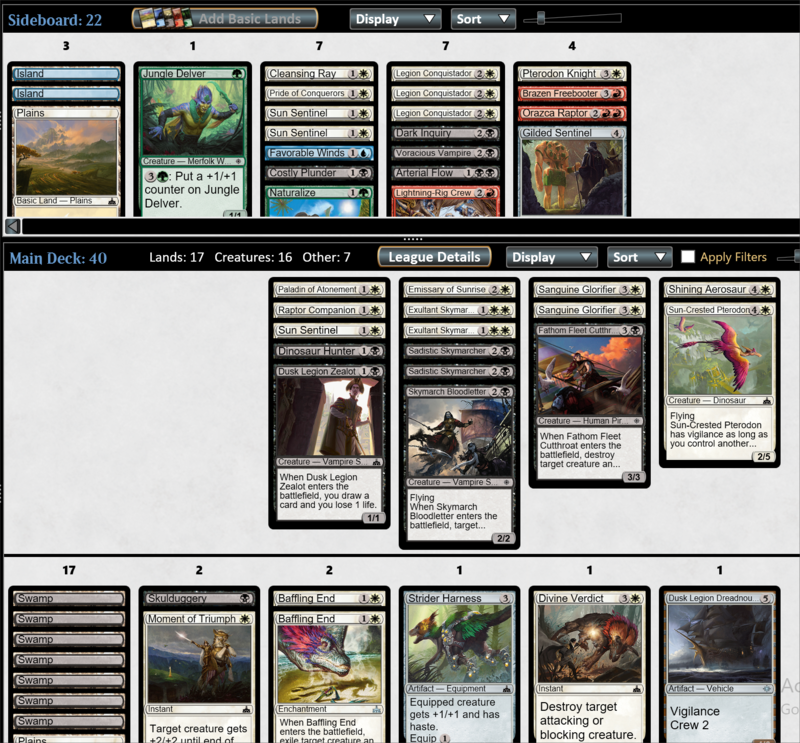 Black-White Vampires was an archetype that the rest of the team was quite high on, so I tried to follow their advice and ended up with this deck. I should have played the Dinosaur Hunter over the Sun Sentinel, but I was unaware of how good the black two drop was at the time. Overall, this deck was quite good, and I was impressed by Sun-Crested Pterodon – in fact, I felt like it may have even been better than Shining Aerosaur. After the draft, I let my team know how good I thought the flier was, as people on our team were already starting to rave about how good the card was. I was also quite impressed by Dusk Charger, and was surprised by how easy it was to hit Ascend – especially with Squire's Devotion. In our team, if you 3-0 a draft, you have to upload your draft to the Draft Viewer so that other people can see how you drafted. You can view my draft here. 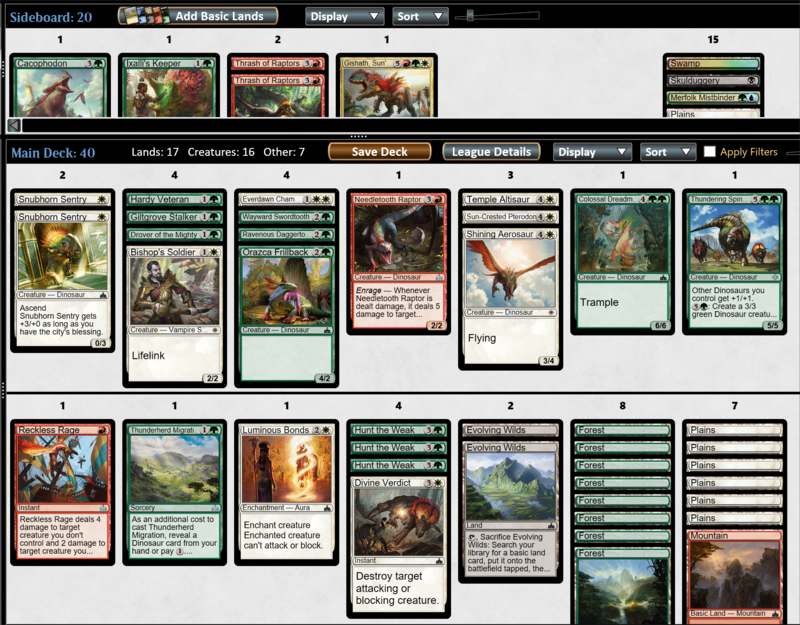 This was the first time I drafted Dinosaurs, which was another archetype that our team was quite high on. The combo between Forerunner of the Empire and Needletooth Raptor was crazy, and after this draft, I started referring to the duo as “Splinter Twin combo.” I think that I mispicked in Pack 1 Pick 1 – I should have taken Forerunner of the Empire over Etali, Primal Storm. This deck had fantastic removal, but unfortunately, it did not have card advantage or a big threat to close the game. This meant that I struggled a lot against my opponent who had three Forerunner of the Coalition and March of the Drowned, as they were able to grind through my card advantage. I think if this deck had a bomb rare and card advantage such as Recover or Legion Conquistador, then the deck would have been much better. 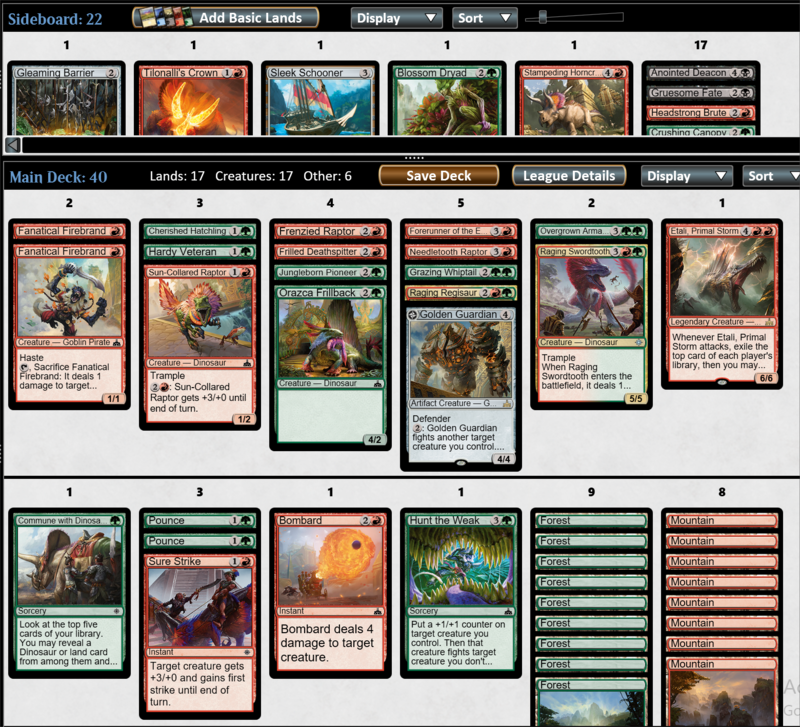 I enjoyed playing this deck, and sort of fell in love with the Dinosaurs archetype after this draft. Although Needletooth Raptor was much worse without Forerunner of the Empire, it was still decent, though I do not know if it was worth splashing. Snubhorn Sentry was a card that Andrea Mengucci was high on, and I was impressed with it as it was a good blocker in the early turns while being a relevant topdeck even in later stages of the game. After drafting this deck, I thought it looked quite mediocre, but my teammates kept telling me that the BW decks often look quite bad but play out well – and this deck played out precisely that way. 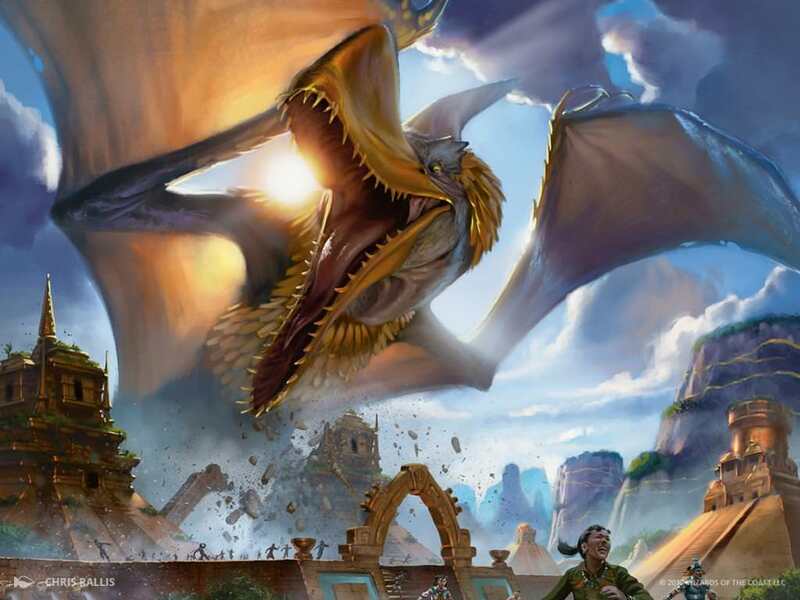 Again, I was impressed by Snuborn Sentry and Dusk Charger, and at this point, we considered Sun-Crested Pterodon as one of the top commons in the set. 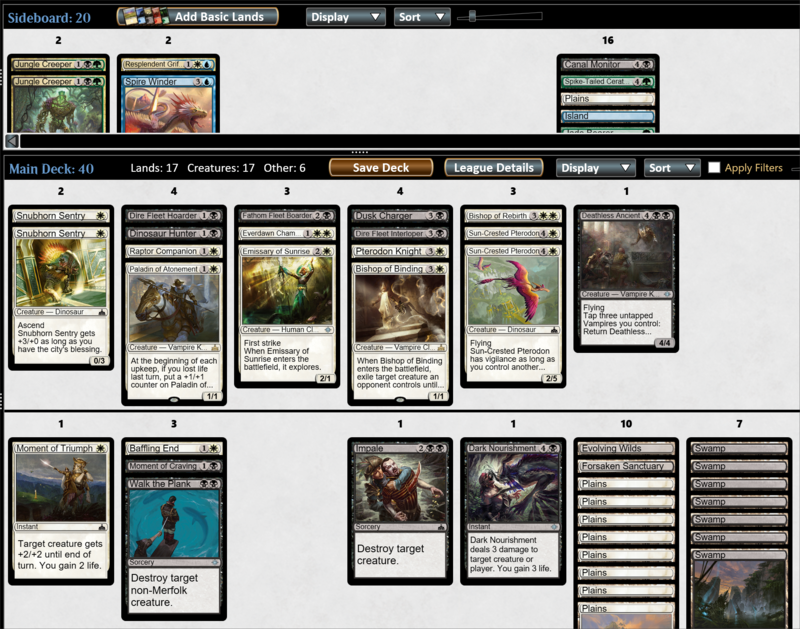 I ended up losing the second round to the mirror where they had Legion Conquistador – which was amazing against my deck. However, in an actual draft where it is not cross pod, it would have been unlikely for them to have that many Conquistadors as I would have been fighting for them as well. This made me realize how important it is to take Legion Conquistadors if you are in BW, as it is excellent in your deck, but it is also one of the best cards against you, so you do not want someone else in the pod to have them. You can view my draft here. I was initially worried by the lack of unconditional removal I had, as I thought I could not beat any bombs. 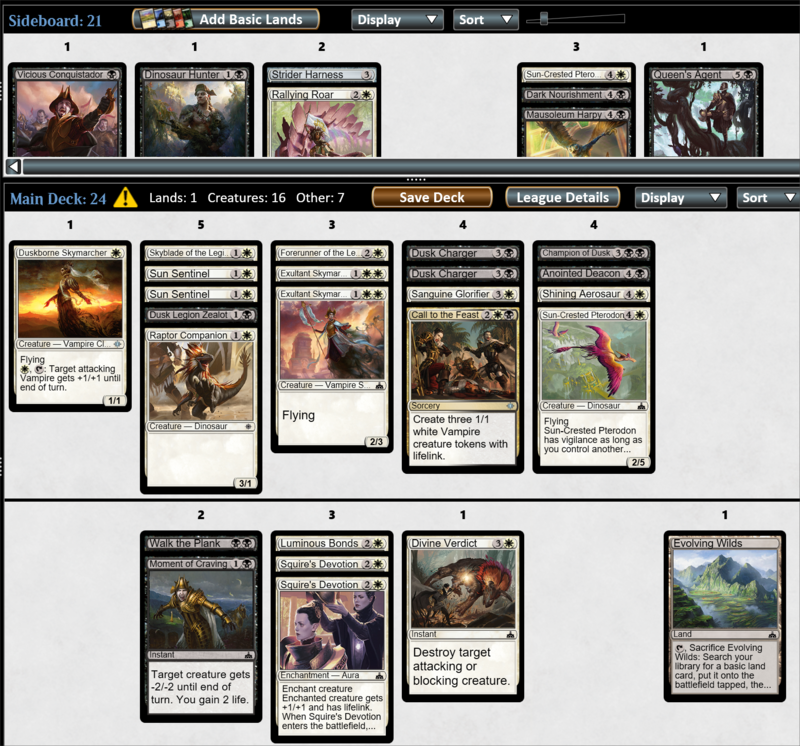 Luckily, I did not face any and played against a couple of aggro decks – which were a great matchup for me. I chose not to play Legion Conquistadors in the main because I already had many good three drops – but that was a mistake. They are actively great against aggro decks and in the mirror, and are only terrible against Dinosaurs. I ended up bringing them in every round for Skymarch Bloodletter, Strider Harness and Fathom Fleet Cutthroat. 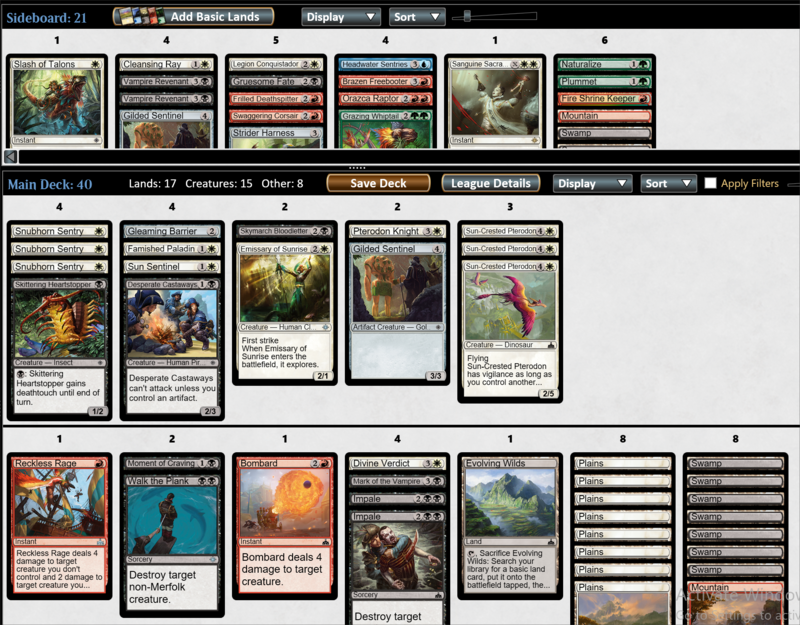 This was the second most enjoyable deck I drafted in this format, with the first being my next deck! I was not sure how good Zetalpa, Primal Dawn would be, but the card ended up being amazing. Although it is expensive, I had various ways to ramp, and had a decent amount of removal which meant that the games would often go long. Also, if I had Zetalpa, Primal Dawn in my hand, I could sculpt my game plan around it by focusing on blocking instead of attacking, as I knew I would have inevitability in the long game. Anyway, that's all I have for this week. Next week, I'll follow-up with Part 2, where I will share two decks from Grand Prix London, two decks from the MTG Mint Card Playtesting House, and also two decks from Pro Tour Rivals of Ixalan! Thanks for reading! Getting ready for Nationals weekend? Check out Zen Takahashi's Core Set 2019 Draft Primer! 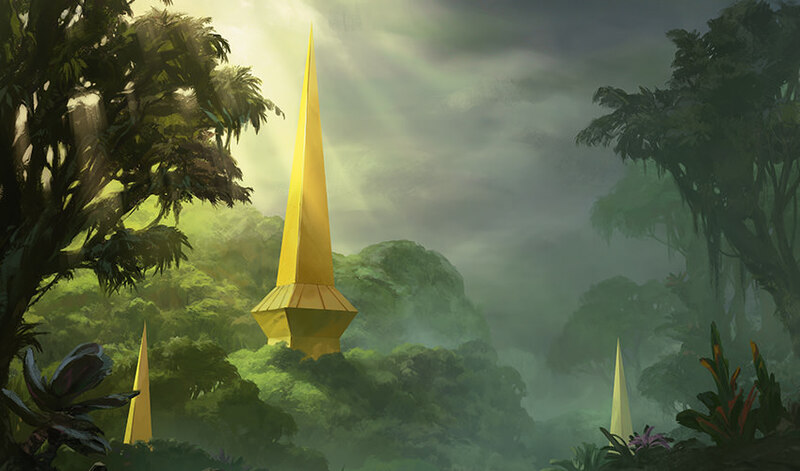 Tobi Henke shares his newfound thoughts on the Core Set 2019 Booster Draft format. Draft Simulator: What's the Pick Core Set 2019? Simon Nielsen opens five Core Set 2019 boosters and peers into the minds of five drafters!